Charles van den Eycken was raised in a family where both his father and grandfather were painters. Not surprisingly, he received his earliest art education under their guidance. Born in Antwerp on April 17, 1859, the young artist grew up at a time when his home town was emerging from the economic and political aftermath of decades of upheaval, first from the Napoleonic wars and then from the revolution of 1830 which resulted in the formation of Belgium as an independent nation. By the time that van den Eycken was ready to begin his career as a painter, Belgium was a reasonably stable and constitutional monarchy. In the mid-1870s, he moved to Brussels to continue his education at the Académie Royale des Beaux-Arts where he studied with Joseph Edouard Stevens (1819-1892), a Realist animal painter. Stevens’s painting was grounded in the tradition of the animalier paintings of earlier decades, but his approach was defined by contemporary realism that eschewed idealized depictions of animals as heroic emblems of nobility. Rather, Stevens emphasized the ordinary animals of everyday life, with a particular focus on working dogs, stray dogs and all of the mutts that wandered the streets of Brussels. 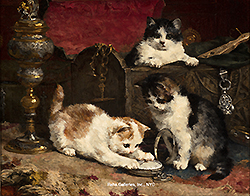 Van den Eycken absorbed his mentor’s attitude as well as his predilection for animal painting. When he emerged from his schooling, he had exemplary drawing skills, an impressive understanding of composition, and a clear sense of direction for his future. Van den Eycken was an early member of the exhibition society known as L'Essor [Soaring], which was founded in 1876 as the Cercle d'Elèves and anciens Elèves des Académies des Beaux-Art (Circle of Students and Alumni of the Schools of Fine Arts). Three years later, the group adopted the name L'Essor because the members no longer wanted to be associated with "academies" of art, perhaps because it implied an aesthetic that the artists did not actually embrace. In fact, L'Essor was an unusually inclusive organization, welcoming Realists, Naturalists, Impressionists, traditional academics and many variations on these concepts. Between 1876 and 1891, L'Essor hosted fifteen exhibitions under the guiding principle of "Unique art, unique life," a statement that has much in common with the design reform movements that were developing in the decorative arts at the same time. At these annual exhibitions, L'Essor also ran a lottery and raffle of art works, thus encouraging the public not only to attend the show, but to buy the paintings. In fact, King Leopold II of Belgium himself purchased paintings in both 1881 and 1882, thus providing public royal approval for the independent exhibition society. With success in Brussels well established, L’Essor began organizing exhibitions in other cities, both within Belgium and elsewhere in Europe. Exhibitions in Ostende, Antwerp and London soon followed, and artists like van den Eycken were quick to appreciate the value of having access to an international clientele. Beginning in 1881, he regularly sent his work to salons in Antwerp, Amsterdam, Barcelona, Ghent, Liège and Madrid as well as the annual Exposition générale des beaux-arts in Brussels where his work was recognized with several medals. 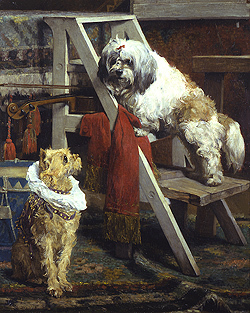 Van den Eycken also received a commission from Belgium’s Queen Marie-Henriette who loved both art and dogs; it is likely that the artist created a painting of dogs for her personal enjoyment. That changed as industrialization created a new class of successful entrepreneurs whose wealth depended not on land, but on ingenuity and business acumen. This group of men typically lived in Britain’s growing industrial cities, with a second home in the countryside where they bred dogs for bloodlines and staged field trials to exhibit the dogs’ skills and physical characteristics. 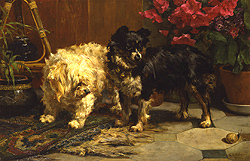 With the development of organized field trials in the 1865 and the creation of the Kennel Club in 1873, portraits of pure-bred dogs became increasingly popular. By the 1890s, van den Eycken had established himself as a leader in this fashionable specialization, and his popularity with collectors was continuing to expand. His painting Gage of Love, was chosen as part of the Belgian contribution to the World’s Columbian Exposition in Chicago in 1893. 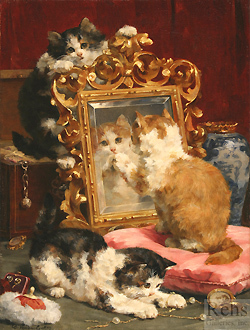 [iii] Three years later, he was recorded as having received a commission from a Chicago attorney, J. G. Moulton for a painting entitled A Cat with her Kittens. Whether or not van den Eycken personally attended the Columbian Exposition in 1893 is unknown, but his relationship with American collectors seems to date from the 1890s. By the end of the century, in 1899, the painter was creating canvases not only for private American patrons, but also for the S. and G. Gump Company, at that time an international art and design gallery based in San Francisco; today it is one of that city’s most elegant department stores. The signatures on van den Eycken’s work from the 1890s places him in Brussels at least until 1899. However, he seems to have moved back to Antwerp at some point before 1902. A review of his work in the Chicago Daily Tribune, dated January 12, 1902, reports that “his studio is in Antwerp” and that “during the last decade, his works have become well known in America, and the sale of his pictures in this country is steadily increasing.” [iv] The Tribune reporter was prescient in his observation as van den Eycken’s work seems to have remained very popular in the US well into the years of World War I. 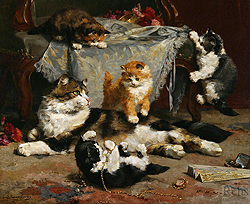 His painting of Kittens in Mischief, for example, was recorded in the American Art Annual as having been sold to J. Clarke in May 1915. [v] Although there is no known record of van den Eycken’s work being exhibited in an American gallery, it seems very likely that he was represented by one of the many European galleries who had opened US branches in the late nineteenth century. Van den Eycken’s work maintained a consistent appeal well into the twentieth century. 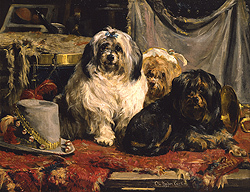 He exhibited Les rôdeurs [The Prowlers] at Paris Salon in 1902, and also continued to sell his work to numerous English collectors. It should be noted that the painter sometimes signed his name as “Charles Duchêne” although the reason for this is unclear. “Duchêne” refers to oak trees in French, and perhaps there was a family history related to this name or the oak as a symbol. The eruption of World War I in 1913 meant that life in Belgium would soon change dramatically. Antwerp was besieged by the invading German army in the fall of 1914, with the result that enemy forces occupied the city until 1918. Although some Belgians were able to escape to the Netherlands in the aftermath of the invasion, most were trapped in the city by both the German troops and an electrified fence blocking the Belgian-Dutch border. Van den Eycken’s whereabouts during this time is undocumented, but it seems likely that he would have remained in Antwerp where his family was based. He died in 1923 at age sixty-four. [i] For a history of dogs in painting, see William Secord, Dog Painting, 1840-1940, A Social History of the Dog in Art, (Woodbridge, Suffolk: Antique Collectors Club, 1992). [ii] Ibid., frontispiece. Van den Eycken’s 1891 painting Willpower is the frontispiece for this book, and the only non-British art work represented. [iii] M. P. Handy, ed., World’s Columbian Exposition, Official Catalogue, Part X, Art Galleries and Annexes, (Chicago: W. B. Conkey Company, Publishers to the World’s Columbian Exposition, 1893) 75. [iv] Art Supplement, Chicago Daily Tribune [Chicago, Ill.], January 12, 1902: 12. [v] “Paintings Sold at Auction, 1914-1915”, American Art Annual, Volume XII, Florence N. Levy, ed., 1915 (The American Federation of Arts, 1916) 300.